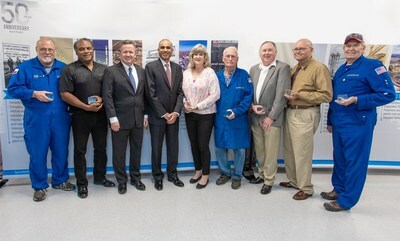 PASADENA, Texas, April 16, 2019 /PRNewswire/ -- LyondellBasell's Bayport Complex in Pasadena, Texas, today commemorated 50 years of operation at its propylene oxide plant and provided an update on their role in the company's most significant capital project to date, the construction of the largest propylene oxide (PO), tertiary butyl alcohol (TBA) plant in the world. The LyondellBasell PO plant was a first of its kind when it was constructed in 1969 near the Houston Ship Channel, using new tertiary butyl hydro peroxide process technology to produce PO. It was designed to meet increased demand for PO in the 1970s. Bayport was selected as the site for the plant due to its close proximity to feedstock and existing pipelines, which are the same reasons the Bayport Complex will be making history yet again. LyondellBasell is constructing the largest propylene oxide (PO) and tertiary butyl alcohol (TBA) plant in the world and Bayport is playing a key role in this project. "The Bayport Complex has a rich history and is pivotal to our company's strategic growth along the Gulf Coast," said LyondellBasell CEO Bob Patel. "In Texas, bigger is often better. For us, this facility marks a new chapter for LyondellBasell and demonstrates our commitment to continued growth and delivering on our commitments." PO is used in the manufacture of bedding, furniture, carpeting, coatings, building materials and adhesives, while TBA will be converted to two ether-based oxyfuels, methyl tertiary butyl ether (MTBE) and ethyl tertiary butyl ether (ETBE). Both MTBE and ETBE are high-octane gasoline components that help gasoline burn cleaner and reduce emissions from automobiles. The PO/TBA plant will have a split facility design to optimize product balances and realize synergies between two LyondellBasell sites. The 140-acre PO/TBA plant is being built at the LyondellBasell Channelview Complex located in Channelview, Texas, while an associated 34-acre ethers unit, which will convert TBA to oxyfuels, is being constructed at the Bayport Complex in Pasadena. The PO/TBA plant is scheduled for startup in 2021 and is estimated to cost $2.4 billion, the company's most significant capital investment to date. The Bayport Complex PO plant traces its origin to Oxirane Chemical Company, a joint venture between subsidiaries of Atlantic Richfield Company and Halcon International Inc. After ownership changes over the years, the plant became part of LyondellBasell's asset portfolio when Lyondell and Basell merged in 2007. The complex, which manufactures materials used in paints and coatings, food packaging and home furnishings, generates approximately $530 million in annual economic activity for the local community and is home to 1,150 workers. Two other plants, in addition to the PO plant, are situated at the 880-acre LyondellBasell Bayport Complex. Those plants include a polymers plant, which began operations in 1974 and an ethylene oxide plant, which began operations in 1981. "For half a century, this plant has played a significant role in the development of Houston's petrochemical industry and its employees have helped shape our local communities," said U.S. Congressman Brian Babin. "I am very honored to help celebrate this significant milestone with LyondellBasell, and I'm grateful for their important contributions to and investments in this area of East Texas." In 2018, American Fuel and Petrochemical Manufacturers (AFPM) recognized the complex with its Distinguished Safety Award (DSA) for exemplary safety performance. The DSA represents the highest achievement in safety and reflects excellence in occupational safety, process safety and occupational health in the domestic refining and petrochemical manufacturing industries. For more information about the complex, visit https://www.lyb.com/en/bayport-choate-plant/. About LyondellBasell LyondellBasell (NYSE: LYB) is one of the largest plastics, chemicals and refining companies in the world. Driven by its employees around the globe, LyondellBasell produces materials and products that are key to advancing solutions to modern challenges like enhancing food safety through lightweight and flexible packaging, protecting the purity of water supplies through stronger and more versatile pipes, improving the safety, comfort and fuel efficiency of many of the cars and trucks on the road, and ensuring the safe and effective functionality in electronics and appliances. LyondellBasell sells products into more than 100 countries and is the world's largest producer of polymer compounds and the largest licensor of polyolefin technologies. In 2019, LyondellBasell was named to Fortune magazine's list of the "World's Most Admired Companies." More information about LyondellBasell can be found at www.LyondellBasell.com.